We were supposed to be outside digging over the allotment on Monday, but as the weather took a turn for the Siberian, we decided to give it a miss. The broad bean seeds will have to wait until next week. There were biscuits to make instead, peanut butter ones.I detest peanut butter. I think it’s absolutely revolting. But in a biscuit, well, that’s a different matter. This recipe is adapted from one of Nigel Slater’s. Cut 200g of butter into chunks and place it in the bowl of a food processor, with 100g of caster sugar and 100g of demerara sugar. Blitz on a medium speed until well mixed and light in colour. Add about 250g of crunchy peanut butter to the butter and sugar mix, along with two eggs. 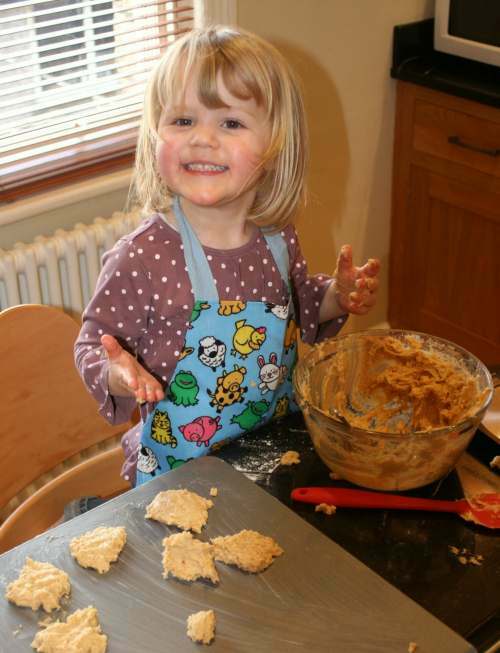 Mix well before adding one teaspoon each of bicarbonate of soda and baking powder and 200g of plain flour. Mix together to form a soft dough. It may be worth transferring the mix to a large bowl before adding the flour, to give you more room and control over the final mixing. If you’ve got a helper, this also gives them a chance to get stuck in. Next, use either a teaspoon of a dessert spoon, depending on whether you like your biscuits big or small, to scoop the mixture onto a greased baking sheet. Flatten each pile of dough a little, but not too much…these are chunky biscuits and should be moist and the slightest bit undercooked in the middle. Bake in a hot oven (190c) for between eight and ten minutes. Watch them carefully past eight minutes, as the edges will scorch very quickly. 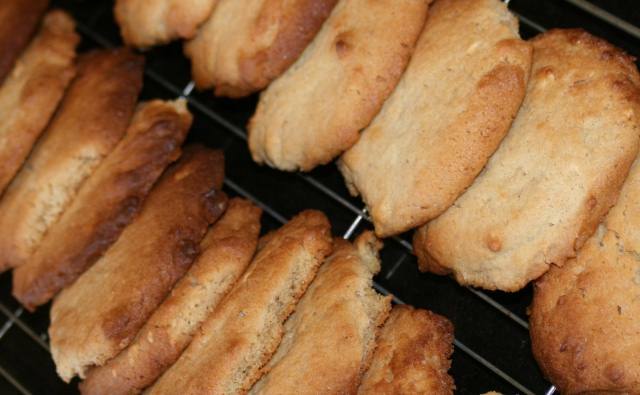 Leave the biscuits on the tray to cool slightly and firm up before transferring them to a wire rack to cool properly.